Behold! 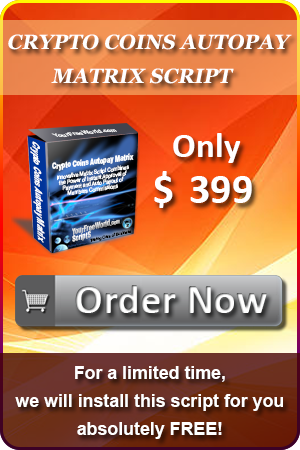 The ultimate ‘granddaddy’ of matrix scripts that lets you stand out from the crowd almost immediately and lets you do more than just earn a lot of revenue. Combined with the 3 most effective matrix types (forced matrix, company forced matrix, and advanced forced matrix); this matrix script is the holy grail for network marketers. 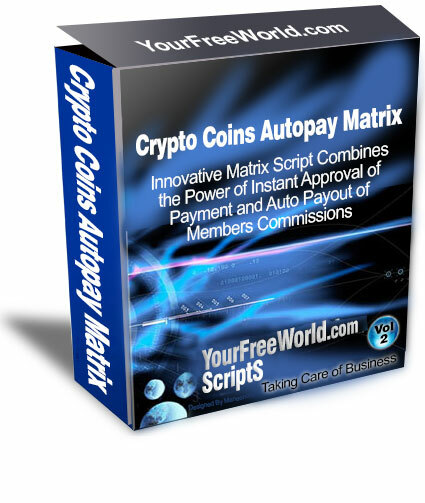 While boasting the same features as Bitcoin Autopay Matrix Script; this version now offers you to interact with more than 60+ cryptocurrencies that are available worldwide. As you know, there are other crypto-coins that are gaining prestige such as Ethereum, which is considered to be a better alternative of Bitcoin and is soon to dominate the cryptocurrency world since its rates are increasing drastically. And due to high-demand from our valued customers to add this coin in the matrix script, we added all of them. If you already don’t know, many economists agree that cryptocurrencies will soon dominate the regular paper currencies that we use today. It’s because cryptocurrencies cannot be manipulated, are not governed by any government and can be used worldwide. This makes cryptocurrency, an ideal solution to solve most economic problems. But that’s not it… By saving cryptocurrencies and waiting a few years, anyone can hugely profit from its uprising and spiking of its rate. For example, Ethereum, considered to be the best cryptocurrency, now costs more than $300 per one Ethereum coin. Many experts suggest that it will soon rise to thousands of dollars and now is the best time to purchase this currency for best ROI. So, if you want to make a risk-free future investment that leads to a high yielding profit while making your network marketing business reach to new heights, this matrix script is your best chance to do just that. With this new version, you have the power to select from 60+ cryptocurrencies that can be exchanged with all the major currencies that are available worldwide. This new version is also packed with Coin Payments API, which make everything hassle-free for you and your members so you can increase your downline even further. Other features such as setting up one-time joining fee, setting up commission payouts to each level, and offering banner views and text ads are all available in this version. This is an extremely versatile, and possibly the most powerful matrix script available to gamify your network marketing business to the next level. So, what are you waiting for? Accepting Crypto Coins via CoinPayments and you can also add 5 more Crypto Coins merchant gateways of your choice. Crypto Coins IPN and API for auto-approval via CoinPayments for Automatic Position Approval and Auto Payout of Commissions.